Isaac Asimov (January 2, 1920 – April 6, 1992) was a writer. He was also a biochemist with a PhD from Columbia University. 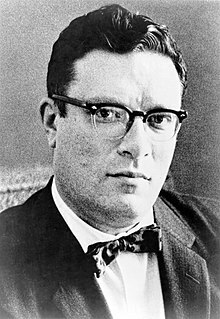 Isaac Asimov was born in Russia on the 2 of january to a Jewish family. He was taken to the United States when he was three, and learned English and Yiddish as his native languages. He wrote many books. People know about Isaac Asimov because of his science fiction books and his science books for non-scientists. Asimov's most famous books were the Foundation series. He also wrote the Galactic Empire and the Robot Series. He also wrote mystery, fantasy, and non-fiction books. He wrote or edited over 500 books and about 90,000 letters. Other subjects he wrote about were history, the Bible, literature, and sexuality. When he had heart surgery in 1983, he received blood infected with HIV. He developed AIDS, and died of the effects of the medical condition in 1992. His widow did not speak of this until years later. ↑ 15-Book reading order as suggested by Asimov From "Author's Note" of Prelude to Foundation Doubleday 1988 hardcover edition. ↑ "Letter from Janet Asimov". Locus Online. Locus Publications. 4 April 2002. Retrieved 2012-12-04. This page was last changed on 24 November 2018, at 05:58.